Jainism was prominent religion during the reign of Rastrakootas and Chalukya sovereigns and patronization by these emperors rendered some great monuments, sculptures and pantheons. Modern Latur city was native and original place of Rastrakootas sovereigns according to several scholars and the fact is corroborated and attested by several paleographic and inscriptional evidences. As time passed, Rastrakoota emperors shifted their capitals from place to place but modern southern Maharashtra, North East Karnataka and Western Andhra was stronghold of Rastrakootas. Chalukyas of Kalyani also governed this area and contributed to some great Monuments, Sculptures and Pantheons. The capital of this empire is known as “Basav Kalyan” today situated in Modern Karnataka State. Mudgad Ramling: - The place named as Mudgad Ramling is situated in Latur district of Maharashtra state. The place is about 67 Kilometers from Latur district headquarter and 110 Kilometers from Osmanabad district headquarter in South East direction. The place has some ancient Jain vestiges along with some mutilated Jain sculptures and inscription slabs. Now a day, there is a small Jain temple situated besides a road passing through the village from Nai chakur to Kasar Sirsi. The small Jain temple is dedicated to 23rd Lord Parshwanatha containing some ancient mutilated Jain sculptures and Inscriptions slabs. 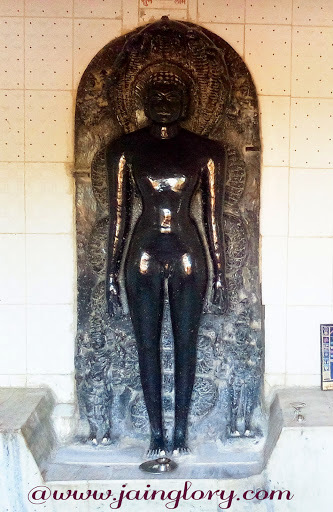 The sculpture of Savior Parshwanatha has height of about 5 feet sculpted in black stone. The image of Jina is mesmeric and meditating in Kayotsarga posture. Cobra hoods are depicted over the head and coiled behind the Jina. A Teerthankar sculpture in padmasan posture and Kayotsarga sculpture of Parshwanatha are in mutilated state and kept in compound of Jain temple. There is not even a single Jain community home in the village and worship is performed by a pontiff from nearby Village Kasar Sirsi. The Jain temple was renovated and present principal deity of parshwantha was also preserved by Akhil Bharteeya Digamber Jain Mahasabha some years ago. The place has some nearby pilgrimages like Nai Chakur and Kasar Sirsi. Inscriptions: - An inscription of 12th century AD was found from this place on a slab lied in the temple compound. The inscription was written in Kannada language. The inscription has documentation about Abhaynandi Bhattarak and Nishdhika of Diwakarnandi Siddhantadeva on two faces of cubical slab. On third face of the inscription slab there is documentation of several preachers of Kondakundanvaya.